Today marks the anniversary of Robert Burns birth in Alloway, Scotland in 1759. 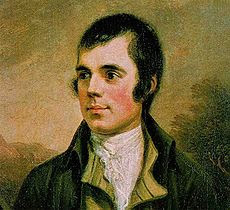 Also referred to as Rabbie Burns, Scotland's favourite son, the Ploughman Poet and the Bard of Ayrshire, there is no other person in history, past or present who's birthday is celebrated the world over as is Scotland's National Bard. Burns Suppers will be celebrated in thousands of locals this evening in the time honoured fashion which includes the eating of a traditional Scottish meal, the celebration of the haggis, the drinking of Scotch whisky and the recitation of works by, about, and in the spirit of the Bard. At the age of fifteen, he fell in love and shortly thereafter he wrote his first poem, primarily in the Auld Scots Dialect. The collection was an immediate success and he was celebrated throughout England and Scotland as a great "peasant-poet." He is also well known for over three hundred songs he wrote which celebrate love, friendship, work, and drink with often hilarious and tender sympathy including, "My Love is Like a Red Red Rose", "Ae Fond Kiss" and "Auld Land Syne." Over his very brief life, Robert fathered fourteen children and not all to his wife Jean Armour, the love of his life and affectionately called "Bonny Jean". Burns died in Dumfries at the age of 37, on the morning of 21st July 1796. The funeral took place on Monday 25th July 1796, also the day that his son Maxwell was born. Over 30,000 people paid their respects. In Dumfries you can visit his grave site at St. Michaels Kirkyard. You can also visit Burns' House where he lived with his beloved Jean Armour. The poet's autograph is scratched in the window with a diamond ring, and you can see the room where he died. In Dumfries you can also visit the Burns Centre and stop by the Globe Inn which was one of Burns' favorite haunts. Have a "wee dram" and visit the site of the first Burns Suppers in 1819 in this 400 year old inn where every corner is steeped in the history of Robert Burns. Not far from Dumfries you can visit Burns' farm at Ellisland where he tried his hand at farming. “Typically, Burns chose this place more for its romantic, idyllic setting than the quality of the soil,” says Les Byers, the curator of Ellisland Farm. In Alloway you can also visit Burns Cottage and Museum, a two roomed thatched cottage his father built and where Burns was born. Just down the road in Mauchline there is the red brick Burns House where the poet lived from 1788 with his wife Jean Armour. It was about this time that his poems were first published. A prized copy of the Kilmarnock edition survives along with personal artefacts, letters and manuscripts.